국가의 보호를 필요로 하는 절대빈곤층의 최저생활을 보장하고 자활조성을 목적으로 실시되고 있는 국민기초생활보장제도의 수급권자는 2005년 현재 전체 서울시민의 1.8%인 186,181명에 이르고 있다. 기존의 시혜적 성격의 생활보호제도가 생산적 복지지향의 국민기초생활보장법으로 전환된 2000년을 기점으로 수급권자의 범위가 확대되어 수급자의 숫자가 큰 폭으로 증가하였으며 이후 일정수준을 유지하고 있다. 국민기초생활보장제도의 수급자의 공간적 분포를 살펴보면 영구임대주택단지로 재개발되어온 노원구, 중랑구, 강서구와 강남구 일부지역에 집중하여 분포하고 있으며 이러한 패턴은 장애인현황의 공간적 분포에서도 유사하게 나타나고 있다. 이와 같이 복지요구가 높은 장애인, 저소득층 밀집지역을 대상으로 지역복지수요에 적절한 복지서비스와 자활지원 프로그램을 확대하여 실시할 필요가 있으며 동시에 이들 지역이 사회적, 경제적으로 통합될 수 있도록 하는 복지사업이 구체적으로 개발될 필요가 있다. National basic livelihood security system is aimed at ensuring the minimum level of livelihood for those living in abject poverty and promoting their self-support. 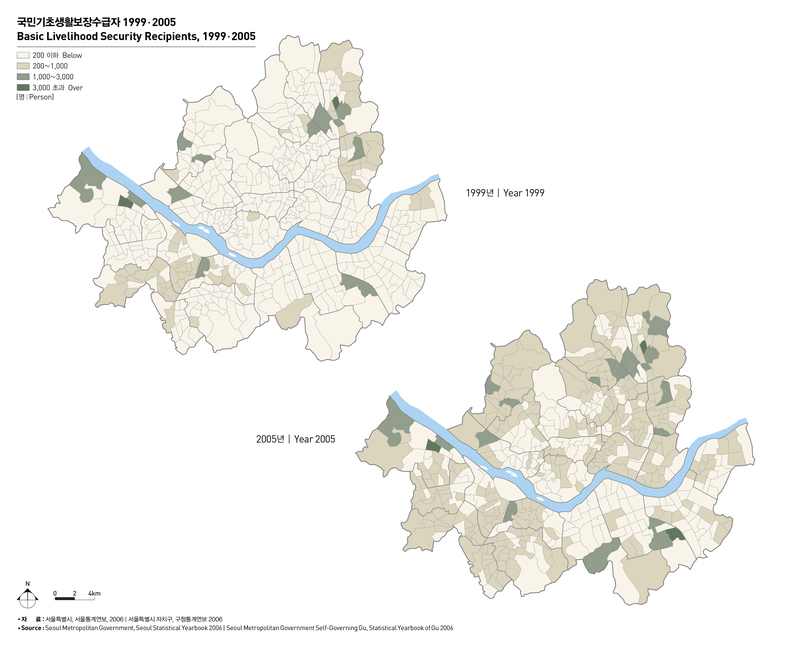 About 186,181 recipients, or 1.8% of Seoul citizens, benefit from the system as of 2005. 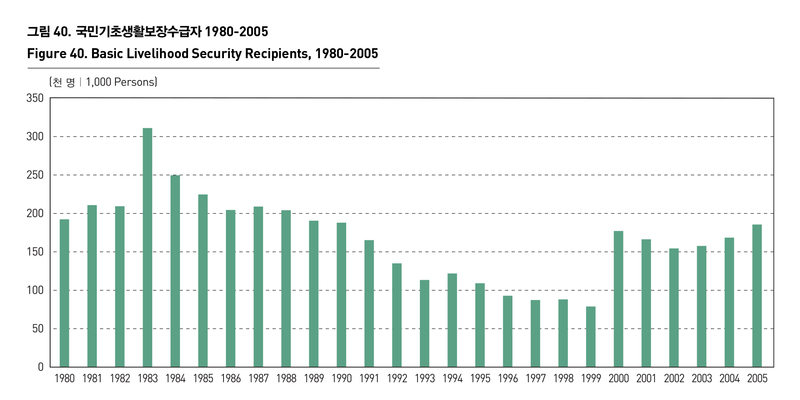 The livelihood protection program was transformed into National Basic Livelihood Security Act in 2000, greatly expanding the range of welfare recipients. 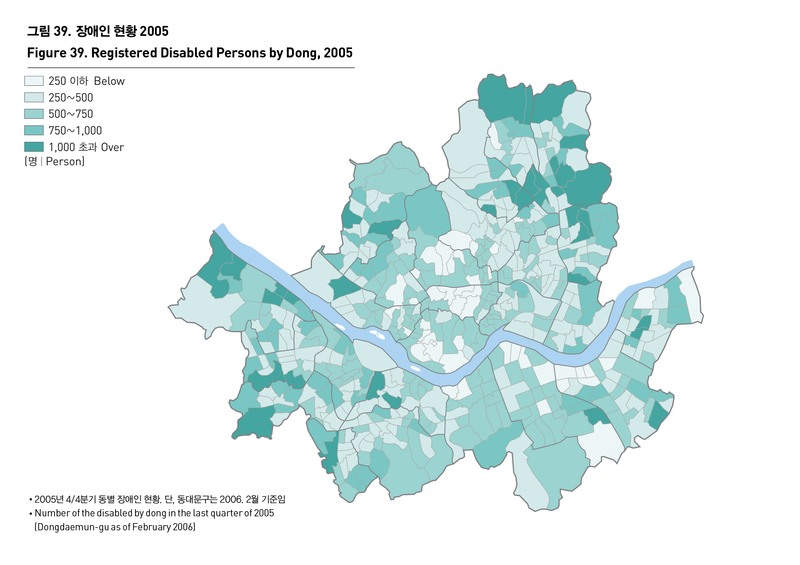 Many of recipients live in permanent rental houses in Nowon-gu, Jungnang-gu, Gangseo-gu, and the South of Han river, a pattern also shown in the case of the disabled. It is necessary to expand a self-support program and welfare services tailored to regional welfare demand for the disabled and the low-income class. The welfare program is also required to advance to ensure the underprivileged could be socially and economically integrated into the community.